Want to get the best battery box or power pack for camping? Battery Boxes are designed with numerous features and outlet sockets to accommodate most campers needs when away on a camping trip. They basically make your Deep Cycle Batteries functional and you simply fit your Deep Cycle Battery into the pre-wired box and you are ready to go. A Battery Box also generally features an LED display to show battery voltage. They are also perfect for mounting a second battery in the cargo area of a caravan, wagon / SUV /4WD or boat. You can use a range of 12V adapters included on the box and if the battery box has anderson plugs you will be able to easily recharge using a solar panel setup. When boating, travelling or camping you may want to also run appliances such as lights, portable fridges and even televisions. To run these 12V devices, you will require a power source such as a generator or solar setup with deep cycle batteries, and in the case of deep cycle batteries, you will need a way of putting power back into the batteries. That is where a great battery box or power pack can really come in handy as you will be able to charge your batteries through a solar panel and Anderson plug connectors. The next level up from a battery box is a 12V Power Pack with a built in inverter. A Battery Power Pack that includes the Inverter will allow you to power the television and other devices off a deep cycle battery, even in the middle of the bush, remote areas or long duration camping trips. Deep Cycle Battery Boxes are a cheaper option for those who are looking to make their Deep Cycle Battery more functional, and they are designed with the ability run 12V appliances for extended periods. A Battery Power Pack with a built in inverter will allow you to run 240-volt appliances from a 12-volt battery for mobile applications, emergencies or simple convenience. A Battery Power Pack can also be used to jump start a vehicle as they are a portable auxiliary battery with jump start terminals. The most typical Deep Cycle Batteries are Gel Deep Cycle Batteries and AGM Deep Cycle Batteries (Absorbed Glass Mat); and in more recent times Lithium-Ion and Carbon Lead. Deep Cycle AGM Batteries are the most popular batteries for Australians who are looking for the best deep cycle technology as well as superior performance. 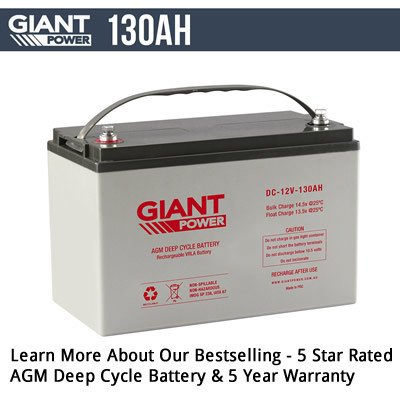 AGM Deep Cycle Batteries are also known as Absorbed Glass Mat (AGM), and they use technology that suspends the free electrolyte within a highly porous (AGM plate) this means the battery is constructed using glass fibre mat separators. AGM plates help eliminate the hazards associated with acid spills or leaks and allows for a sealed maintenance free design that avoids any need for regular topping-up of an electrolyte. You can spend anywhere from around $4.00 to over $400 on a Battery Box Setup, and you'll usually get exactly what you pay for. Battery Boxes vary from the very simple right up to a complete electrical power pack source system including battery charger, portable power station, battery management system, and even up to a dual battery system. It should be moulded from high density, high quality, corrosion-resistant polypropylene at least 4-5mm thick. There should be multiple, closely spaced internal ribs on all sides and bottom for maximum battery support, as well as multiple ribs in the lid so when it's closed it sits firmly on the battery top. The box will have an internal tie-down strap, a wide, strong, thick woven external carry-strap, and ideally two tie-down straps or foot clamps and heavy duty stainless steel screws so you can lock it in place in your boat, caravan 4 x 4 or RV. One-step up from these very basic ones, (and highly desireable) are Battery Boxes with internal power connections from the battery leading to protected external cable connectors. Any and all connectors or sockets must be high quality Andersen plugs and quality, Hella or Merit-type sockets. and 160Ah. They'll also suit almost all battery types including from lead acid, Gel, AGM, and Calcium. From there you can go right up to the top-of-the line models: These Battery Power Packs are really complete electrical systems which have an inbuilt 300W Pure Sine Wave inverter which allows you to safely use both 12V and 240V appliances from the external sockets, including power lighting, portable fridges, and solar panels. accessories), an Anderson Plug, and they'll suit batteries up to 150AH. And from there, you can even go up one more step to a custom-built box where every feature, including instruments, the number of sockets and plugs etc can be built specifically for your needs. We'll be happy to talk to you about any of these options. For expert advice email or call our friendly team on 1800 853 315 and let us help you find the Best Battery Box for your needs from our 12V Portable Battery Boxes Range. Nathan is the owner of Aussie Batteries & Solar, and has been immersed in the battery industry for many years. Growing up on the Sunshine Coast, he enjoyed taking full advantage of the spectacular outdoors on offer, and has turned this passion into a thriving business. As the saying goes, "Find a job you love and you will never have to work a day in your life".